I bought a new sketchbook the other day. I’m trialling it for a trip I’ll be taking later in the year. On previous trips I’ve treated myself to Moleskine sketchbooks, but I’m not completely convinced that I’m not just paying for the name. Given the ‘status’ of the Moleskine, it’s not surprising that other art supply companies are making ‘clone-skines’ to tap into the same market but at a much lower price-point. The clone I’ve bought from my local art shop is slightly wider than the Moleskine sketchbook which I normally buy, not to mention being half the price. The clone does have the elastic strap and pocket at the back of the book. The paper is 150gsm, acid free, so pretty standard. I don’t expect this paper to be good for watercolour. However, when I assessed the types of drawing and painting I did on my last trip I realised that it was sketching, not painting, that dominated my output. So a watercolour friendly paper is, realistically, not my first priority. So far I’ve tested my acrylic paint markers and have been pleasantly surprised at the result. Not only does the paper take my thick marker quite well, it doesn’t bleed through to the back of the page. A drawing on the back of a page which also has a thick black acrylic paint marker drawing on it. Only one slightly disparity has occurred. The paper loves my Posca paint markers, soaking up the black lines to a matt finish, but it doesn’t react so well to my Liquitex paint markers. In the drawing below the black is the Posca and the red is the Liquitex. 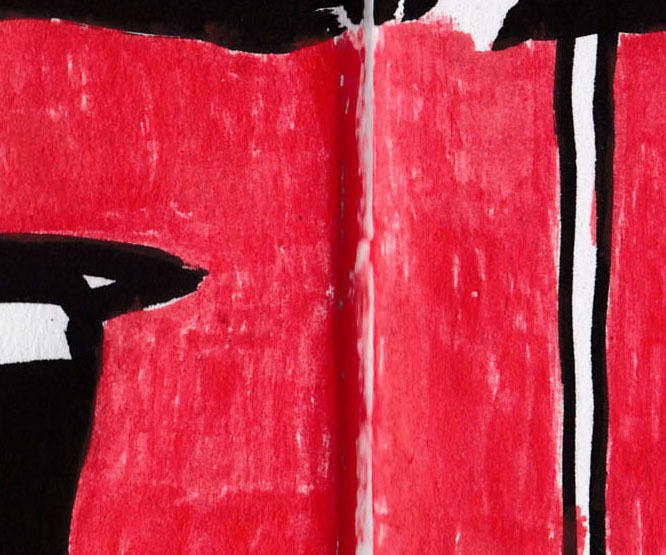 I couldn’t get any sort of smooth coverage with the red and repeated applications would have ended up tearing the page. Two brands of paint markers, two different quality of coverage. Here’s a close-up of the two colours side by side. I have been happy with the coverage of the Liquitex pens on a range of other papers, so all I can conclude is that they don’t like this specific type of paper. This is a bit of a drawback as I have quite a good range of colours in the Liquitex and I’m not desperate to spend more just to buy similar colours in another brand. Close-up of the coverage of the two brands of markers. I’ve also taken my Lamy Safari pen for a test drive on the paper and once more I was really pleased with the line and the way the paper took the ink. 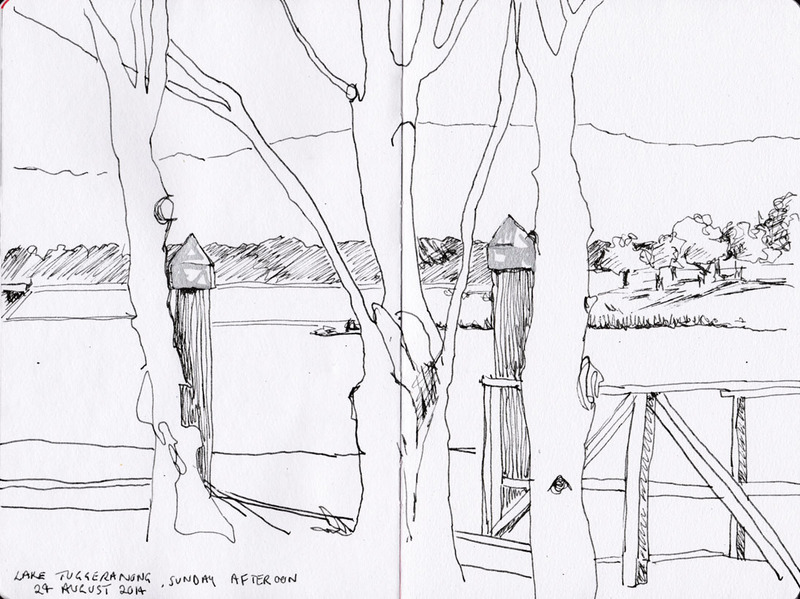 Drawing using the Lamy Safari pen in the new sketch book. I’m planning to try watercolours and a few other things in this book before I make a final decision on whether I go with the clone or not. I’ll keep you posted. This week I’ve been working with my acrylic paint markers again. 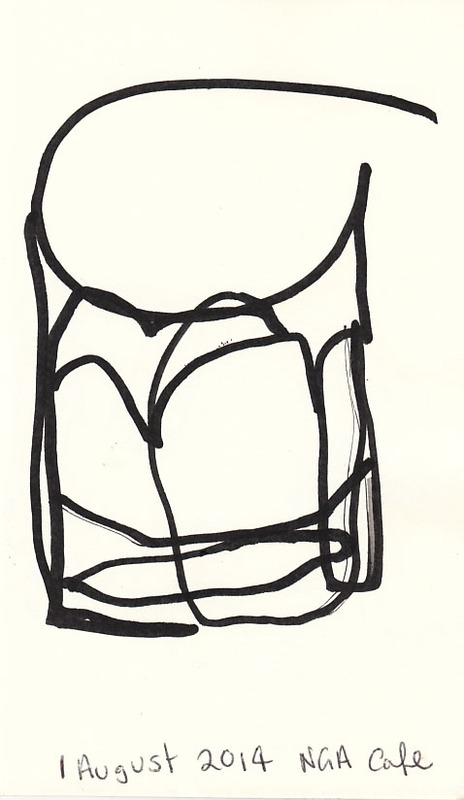 I like the bolder stroke which, along with the blind drawing approach, acts against making ‘tight’ drawings. 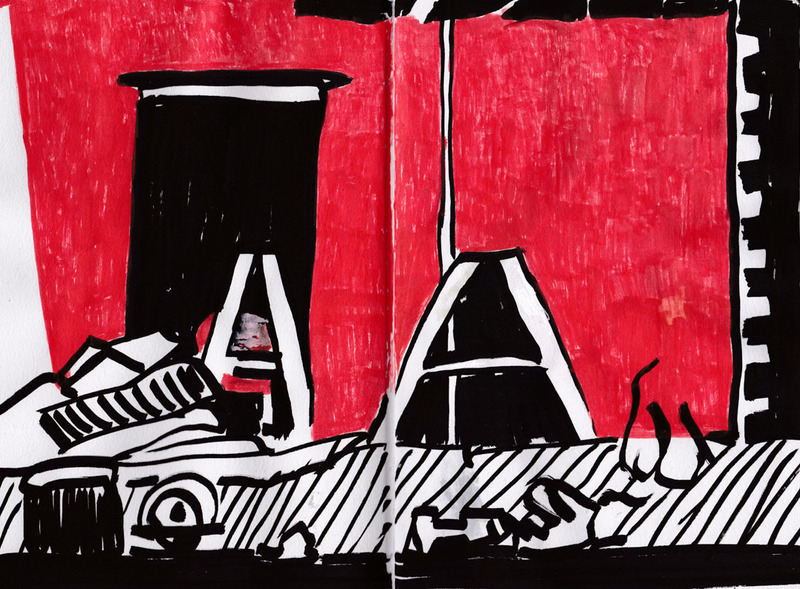 Earlier in the week I drew a coffee shop table arrangement, with just the black marker. Next up I tried both the black and the red markers, being bold and adding some of the reflections as well. 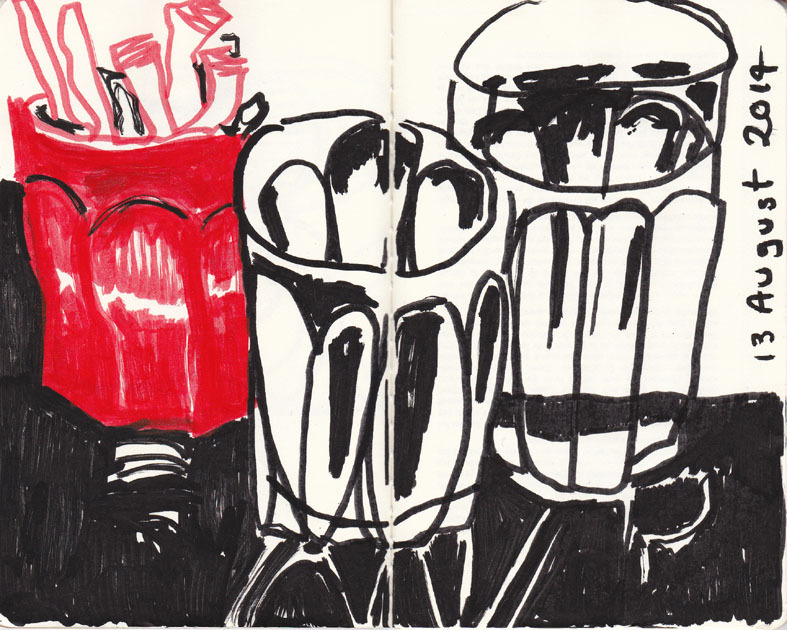 Glasses and a cup of sugar straws, acrylic paint marker, 13 August 2014. 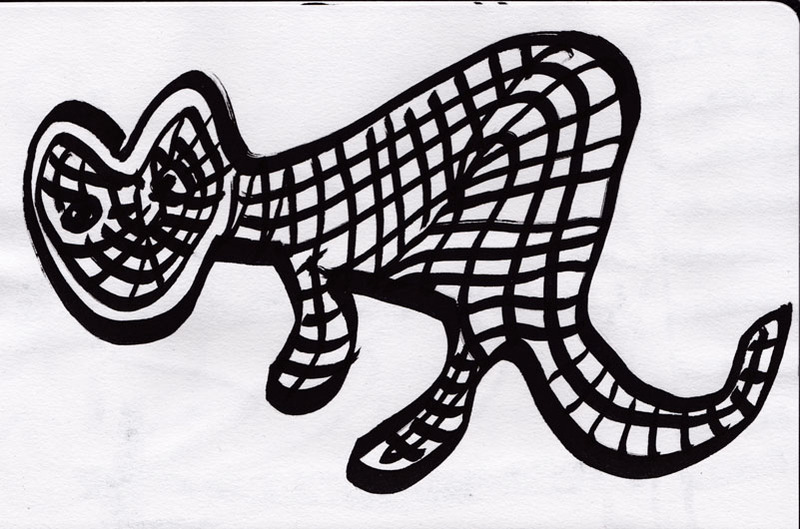 I can see this style of drawing being easily translated into a lino print. Not that I have been anywhere near the print workshop so far this year. I’ve been making ‘blind drawings’ over the last two weeks. Not many, but some. I’m currently going flat out preparing for an exhibition in October. I’m filling an unexpected vacancy at the Tuggeranong Arts Centre with a solo show of my stitched works, (one of two such centres in the ACT), so most of my attention is going to making work for that show. Firstly, using my black Posca acrylic paint marker, I drew another ‘architectural’ glass. 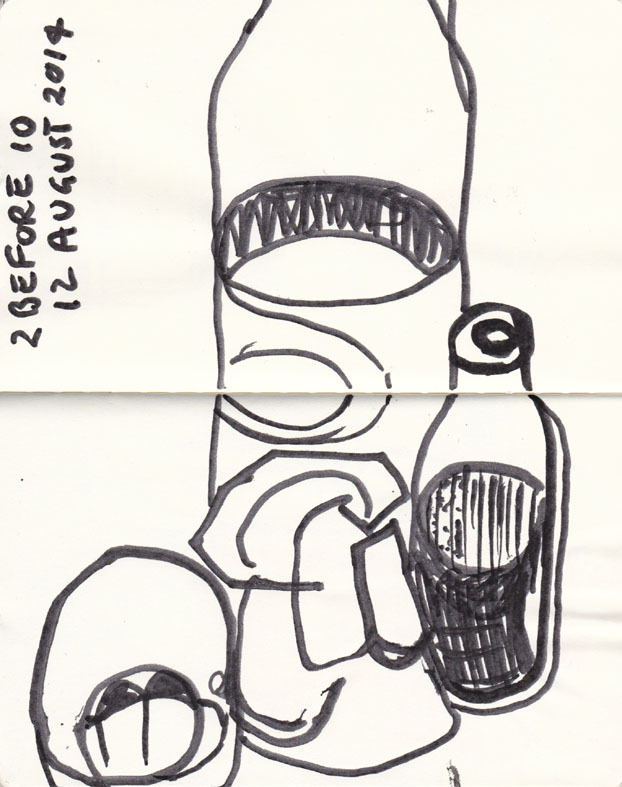 I made this drawing at the National Gallery of Australia. I find that after a week bent over my own work I’m needing a major art fix to re-charge my batteries. I’ve recently been to see the NGA show of Robert Motherwell’s prints At Five in the Afternoon (not a reference to the cocktail hour). Last week a quiet week day break at our local coffee shop provided the opportunity to draw a truck and small digger working at a building site across the road from where I was sitting. I couldn’t fit it all on one page so it’s over two double spreads of my 3″x5″ sketch book. I’m not sure why, but I get a real buzz out of drawing trucks and construction equipment. 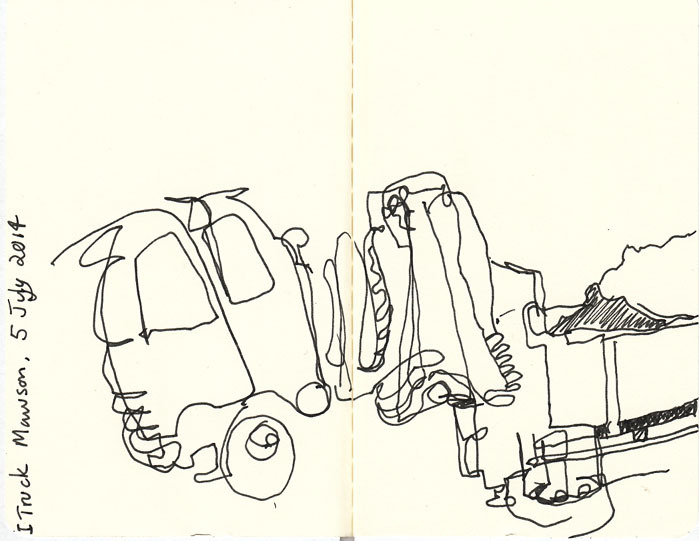 The first half of the truck drawing, pen and ink, 5 August 2014. I just noticed that I was more out of it than I realised as I’ve written July, instead of August, for the date of the drawings. Anyway, here is the back half of the vehicle with the digger. 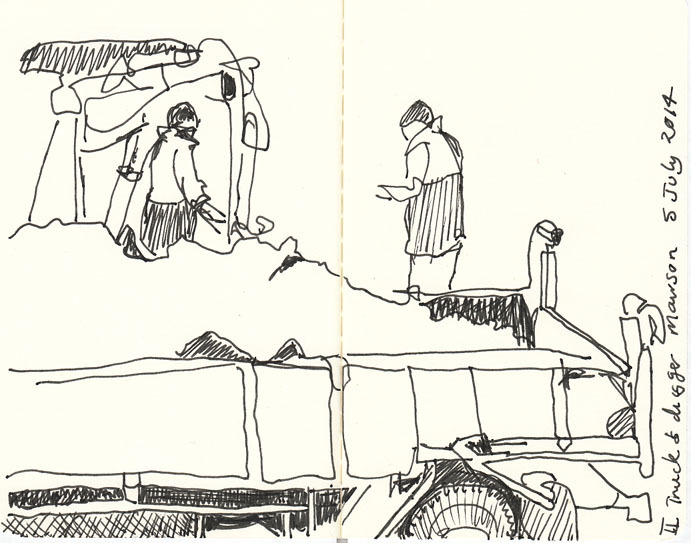 The second part of the truck drawing, 5 August 2014 (not July), pen and ink. I couldn’t resist putting the two images together. The two halves of the drawing brought together.